Many people are afflicted with bruxism, the clenching or grinding of teeth. Some people may do this consciously during the day, but it is a larger problem at night while you are asleep. Grinding your teeth can damage enamel, wear down teeth, cause jaw pain, or irritate your gums. Clenching your teeth can cause severe cracks in the teeth and is a common cause for headaches and migraines. If you clench or grind your teeth you should consider a night guard or splint. These devices provide a barrier between your top and bottom teeth while you sleep. All night guards and splints are custom fitted for comfort and to allow for proper breathing. Dr. Eggert will take an impression of your teeth and have the appliance created by a dental lab. 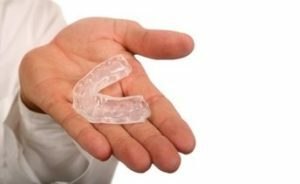 Night guards and splints are very durable and can often be used for years. There are also some things that you can do to try to stop bruxism. You can train your jaw to be free and easy rather than clenched. Refrain from chewing gum or on other objects like pens. You should also avoid alcoholic drinks and drinks with caffeine, as these can increase the likelihood you will clench or grind your teeth. If you suspect you might be afflicted by bruxism, set up an appointment with us today.